The Meir Amit Intelligence and Terrorism Information Center has examined the names of every person killed in the Gaza "return marches" every Friday since last March. The results are nothing short of remarkable. The events of the “return marches” in the Gaza Strip have continued for 42 weeks. In most cases, these events are characterized by a high level of violence, resulting in casualties among the rioters, mainly among those in the front line confronting the IDF troops. According to the ITIC’s examination, based on reports of the Gaza Strip Ministry of Health in combination with other sources, since the beginning of the “return marches” on March 30, 2018, a total of 187 Palestinians were killed in those events. As for the identity of the fatalities (updated to January 16, 2019), 150 of them were found to be affiliated with Hamas or with other terrorist organizations (about 80%). Prominent among the fatalities are those belonging to Hamas or affiliated with it (96 fatalities, about 51% of the total number of fatalities). 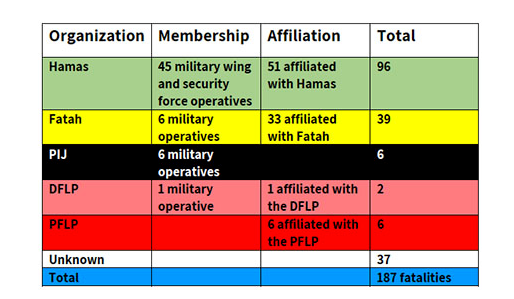 A total of 45 fatalities are operatives of the Hamas military wing (about 24% of the total number of fatalities, about 47% of the total of the Hamas fatalities). The large number of fatalities from the terrorist organizations on the front line demonstrates that the violence against the IDF near the border is not “popular,” as the false Palestinian propaganda wishes to convey. It is orchestrated by Hamas and significantly involves operatives of Hamas’s military wing or operatives affiliated with Hamas. It also shows that the IDF soldiers do not shoot indiscriminately at “innocent” demonstrators but instead, in most cases, target and hit specific terrorist operatives. It should be noted that the Gaza Strip Health Ministry, whose reports are used as a source for media outlets worldwide (as well as in Israel), does not provide information on the organizational affiliation of the fatalities, thus helping to convey a false idea of killing “innocent” demonstrators by the IDF. Hamas is encouraging civilians to charge the fence and to be in the line of any Israeli bullets - and even so, Israel has managed an incredible rate of 80% terrorists killed - in fields where the majority of people are civilians who are bused in by Hamas to enjoy the demonstrations. The Meir Amit Center keeps track of the identities and affiliations of all the dead, based on information from funerals, terrorist websites and other sources.